To Sum It Up: In Victorian England, Evelyn Wyndham longs to travel and see the world rather than constantly attend local social gatherings in the hopes of fulfilling her mother’s wish to see Evelyn marry well. The sudden disappearance of Evelyn’s sister, Rose, however, pushes all other matters aside. Evelyn’s sole focus becomes finding Rose, even if she has to break social propriety to do so. Evelyn’s search uncovers a startling discovery—that some individuals develop special abilities, and this may be precisely why her sister has been taken. Review: Hmm . . . it seems we have another case of It’s Not This Book, It’s Me here because a ton of readers enjoyed These Vicious Masks. Going into the book, I had been all set to be one of those readers because These Vicious Masks was being touted as a mashup of Jane Austen and the X-Men. I also went into this right on the heels of the incredible Vicious by V.E. Schwab, another novel about extraordinary beings. I very much wanted to make it 2 for 2 with the superhero reads, but alas, it was not meant to be. 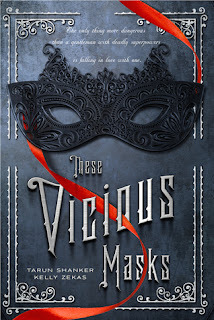 These Vicious Masks left me with an overall feeling of needing more: more depth to the characters and the plot, more world-building, and more urgency to the conflict. The novel begins on a promising enough note, with protagonist Evelyn quickly establishing that she has a sassy side to her and isn’t afraid to say what she’s thinking. Later, though, as she searches for her missing sister, Rose, in London, Evelyn also shows a more reckless side, one that had me shaking my head at the danger she threw herself into. I’m not saying that she should have played the damsel in distress; rather, she took her thinking too far to the other extreme at times, believing that she needed zero help. There’s a strong scent of a love triangle here, and I can’t say that I found either Mr. Kent or Mr. Braddock particularly intriguing. Mr. Kent is quite the wit and Mr. Braddock quite the brooder, but like most of the characters in this book, there’s not much more to them than a singular, defining personality trait. I definitely wanted to know the history between Evelyn and Mr. Kent, as they already seem very well acquainted in their first scene together on the page. I never felt that those details were satisfactorily filled in, though. While I thought that Mr. Braddock was a slightly better developed character than Mr. Kent because at least we get some backstory for Braddock, it’s still not quite enough to make him seem like a fully fleshed out character. The world-building felt similarly light and didn’t create the immersive experience that reading, say, Gail Carriger’s Victorian steampunk novels does. 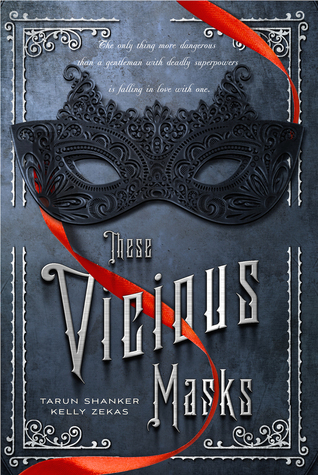 These Vicious Masks is also a bit light on the plot elements; Evelyn is on a mission to find her sister, and that pretty much sums up the book. The superhero aspect was a letdown, too; I picked this book up specifically because of the combination of the superpowers plus the historical period, but these characters and their abilities could have been transplanted to any era. Nothing made them unique to this one. Unfortunately, I was not the right reader for These Vicious Masks. There are plenty of other readers who did find it to be their cup of tea, though. It might be yours as well, but it just wasn’t mine. All in All: More of a sense of being in Victorian England and more character/plot complexity were what I was looking for here. There are some very clever lines of dialogue to be sure, but the book’s wit couldn’t quite make up for what it lacked in other aspects. It's funny you should say this, because my friend was begging me to read this book a while back and I never got around to it, because I flicked through a couple pages (cheater. I know) and did not like what I read. I probably should have tried reading an excerpt first, but I was so excited about the premise, I just dove in. Definitely not continuing the series, though. Sadness :( I've heard great things about this book, and I still want to read it (the X-men/Jane Austen description had me). But character depth is super important to me. Hope your next read is better! Thanks! :) It just wasn't for me, but I hope you have better luck with it when you read it! Aww, thank you! :D This book featured so many things I love, including the historical period, but it just couldn't pull them together. I'll keep searching for my perfect Jane Austen/X-Men mashup, lol. The premise of this book is definitely appealing to me, it's too bad it wasn't executed well! The male leads sound so appealing to me too! There was definitely potential for them both to be very interesting characters, if only they'd been more fleshed out. I wasn't too invested in any of the characters, sadly.